A week ago I began my series of tributes to life in Thailand and a week from now I will be on my way to Bangkok, leaving Isaan (for the time being) to begin a two week trip to Malaysia before heading home. Today’s tribute is to Thailand’s night markets. 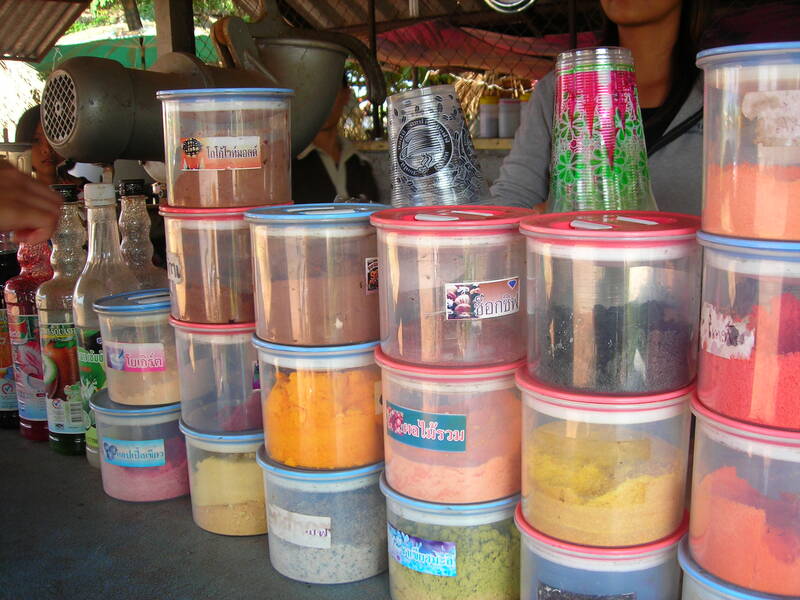 It is common for many Thai families to purchase their dinners at the local night market, where foods like curries, stir fried vegetables, grilled meats, and an assortment of fruits and desserts are sold. 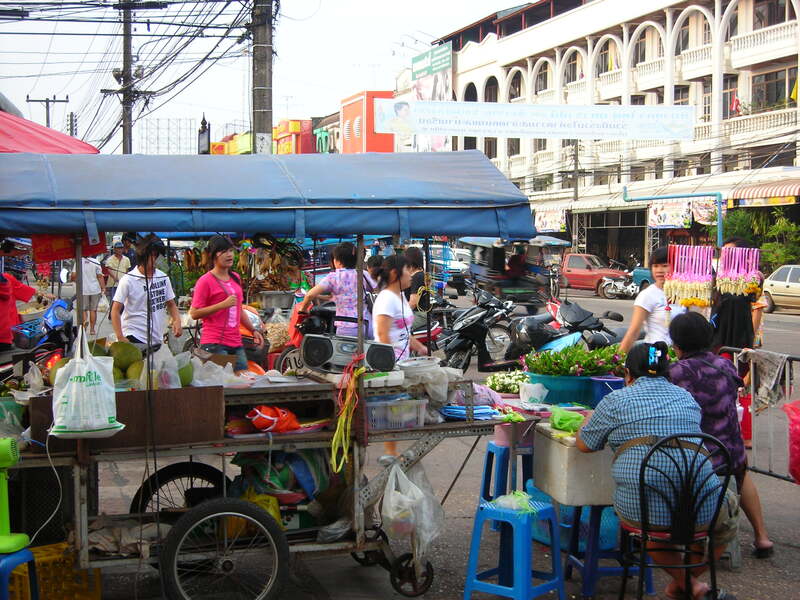 The markets are set up on a main street every night, and by the time the sun is setting the parked motorcycles begin to line up, as people flock to purchase their meals for the evening. Everything is sold in clear plastic bags, tied with red rubber bands (which are skillfully wound, it’s quite remarkable to watch), or on a stick. There is a cart for everything, too. My favorite carts include the curry cart, the corn on the cob cart, the fresh pineapple dipped in saltwater cart, and the dessert cart that sells one of my favorites, khanom chun. Shopping for dinner like this is so exciting and I am definitely going to miss all this variety found in one, easily accessible location. My WorldTeach roommate Steph and I have a pretty sweet deal when it comes to living arrangements. Our Thai roommate, Pi Yok, prepares or buys our food every night so we never have to worry about where to find our next meal after a long day of teaching. This convenience does come with some setbacks (my mind wanders to the night we were served a chopped up and stir-fried frog, or when we were given raw lap, a popular Lao/Isaan meat dish with chilies and herbs) but most days the food is delicious; we even have a favorite dish we’ve come to look forward to, a savory vegetable omelet over jasmine rice, every Friday. 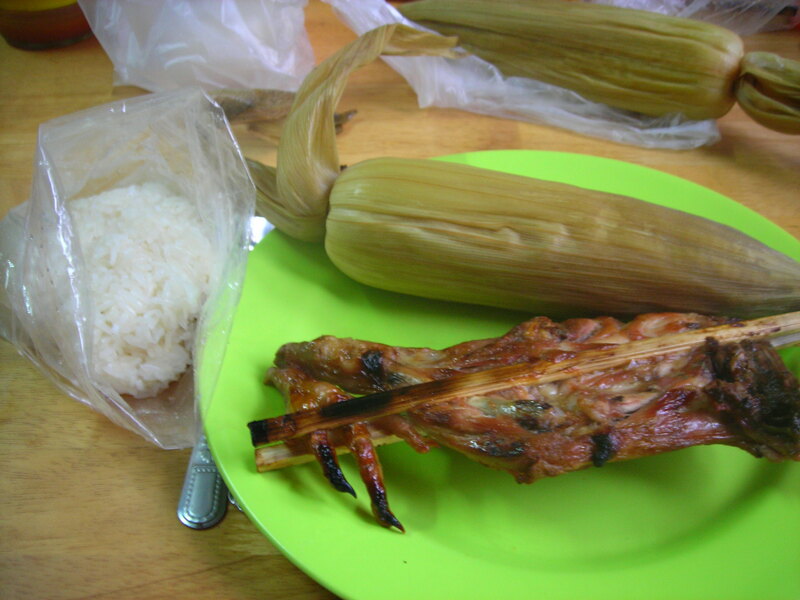 Yesterday we had a typical Isaan meal (pictured above) which was purchased from the daily market: grilled chicken, a handful of sticky rice, and an ear of corn (though the chicken doesn’t always come with feet sill attached!). Sticky rice and grilled meats are staples in the Isaan diet, as are fresh vegetables, soups, curries, eggs prepared in a variety of ways (omelet, fried, hard-boiled), and of course: som tam! Som tam, or papaya salad, is made with shredded green papaya, tomatoes, long beans, peanuts, chilies, lime, fish sauce, and sugar. It can be prepared with a variety of other ingredients and the papaya may be substituted with vegetables such as long beans or cucumbers. I eat som tam at least twice a week at school and usually once during the weekend. For me it was an acquired taste but I find myself craving it now; I’m also proud of the fact that I’ve graduated from the less-spicy anubaan (kindergarten) Thai version, teasingly named as such by Pi Tuk. I can now tolerate som tam Lao, though it still leaves my lips burning long after I’ve left the table! 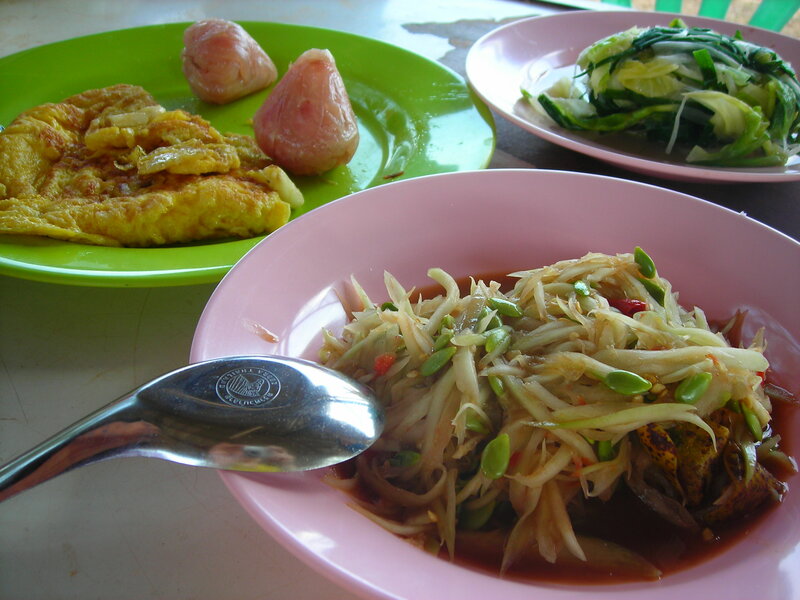 One of my favorite things about the Isaan diet is the freshness of the fruits and vegetables. Second favorite thing: availability. Fresh markets are as common here as Walgreens and CVS stores are in the United States. I am also continuously amazed by the bright orange color of the beta carotene-packed egg yolks, a stark contrast to the washed-out pale yellow yolks found in the States. Food has been on my mind (more than usual) since reading Michael Pollan’s In Defense of Food and it’s hard not to draw comparisons between my diet here and in the U.S. It will be interesting as I navigate my way once again through the grocery store aisles after 1) having meals provided for me during the past year, and 2) living in a community where the closest thing to a grocery store is an open-air pavilion lined with local farmers selling their daily harvests. The transition will be note-worthy, to be sure.